While the advertising world continues to make giant strides toward gender equality, there is an emerging yet unfortunate side effect. Male talent often avoids working for female agency leaders when they have other options. This finding isn't necessarily widespread; men still dominate the top ranks. And many female-led agencies say they don’t see this problem — probably because those applying to such shops are self-selecting. Men wouldn't apply if they had issues about working for women. However, several recruiters admit they find a small, growing number of male applicants preferring not to submit their applications to female-led agencies, if given the preference. Two female leaders who spoke off-the-record to MediaPost about their agency’s difficulties in achieving an equal corporate culture echo this sentiment. They say men not only refuse to interview at their shops, but that once men gain experience, they don't stick around when other opportunities emerge. "This falls under unconscious bias," says Dr. Sheila Robinson, publisher, Diversity Woman Media. These thought patterns, assumptions and interpretations are based on beliefs usually learned at an early age or from others whom individuals looks up to, says Robinson. "It is a form of judgment that generally occurs without awareness, intention or knowledge, but some are buried prejudices that influence decisions." So what can the industry do to address this problem? First, they need to recognize that not everyone is on the same page when it comes to gender diversity. A recent report from McKinsey and LeanIn.org finds nearly 50% of men think women are well represented in company leadership at organizations. In reality, only 10% of senior executives are women. Nearly two in three men (63%) say their company is doing a better job addressing gender diversity versus 49% of women who feel the same way. More than one in three men (37%) believe their company appropriately handles gender diversity matters when they arise, compared to 23% of their female colleagues. Although 58% say gender diversity is a very important or top personal priority, only 47% of men agree. The advertising world, especially media agencies dominated by women, should lead by example rather than settle for being part of the industry average, says Siftly founder Frank Striefler. "Our day job is to change people’s behavior and attitude." According to the job platform's online survey conducted exclusively for MediaPost during the last week of November, seven in 10 advertising professionals of both sexes say they don't care about the gender of their superior. That said, among those who do have gender preferences, women are more comfortable working with women. 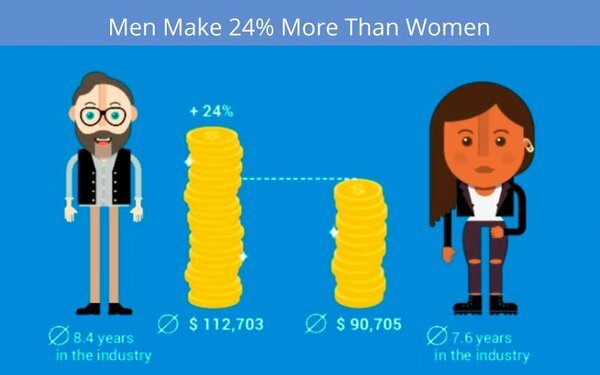 One in five (22%) women prefer to work with a woman, while only one out of seven men (14%) prefer working for a man. This gender preference — having a woman or man as your boss — goes down with women as they become more senior. It's also important to recognize that each situation provides an opportunity to learn and grow from the experience. Yes, there are men who are misogynists. But talent needs to acknowledge the shops fighting for gender equality. Recently, Interpublic's FCB Mayo hired the first female creative director in Peru. Let's hope Jorgelina Díaz will thrive in a male-dominated culture like South America. Still, it isn't easy to overcome sexist attitudes, particularly when they are endemic. Too often, people are unaware they are expressing them. Education and commitment are key to eliminating this major barrier for women, says Robinson. Education helps acknowledge the problem and creates the awareness of what unconscious bias means. The commitment from the top to put the necessary training into place to eliminate these biases will help achieve gender diversity in organizations. Despite the fact The Social Element has always been a female-led and owned agency, a few years ago, the U.K.-based social-media shop had a senior-level team member who didn't gel with its culture. "He never seemed 100% happy, and others reported they found him abrasive and difficult to work with," says Wendy Christie, Chief People Officer, The Social Element. He made a point of mentioning the “overwhelming female demographic” at his exit interview, she says. "This really underlined for us how vital it is to recruit to our values and culture, to ensure that the people we hire will be able to collaborate effectively with our team, so that they’ll be happy here." Perhaps the most important aspect of gender equality is simply bringing the matter up for a broader discussion. Men, for instance, don't seem to realize there is a sharp imbalance between gender and compensation. 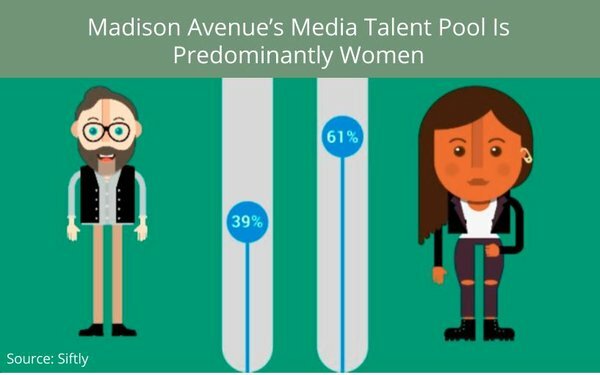 While women comprise the majority of talent in the media (61% vs. 39%), they make 24% less than men ($90,705 vs. $112,703), according to Siftly and MediaPost's 2017 Salary Survey. More than 60% of ad professionals expect to change their job within the next 12 months, meaning many could possibly work under female leaders, reports Siftly. Both genders ultimately need to feel comfortable discussing their thoughts and concerns. Women were even hesitant to take a poll querying about this issue, per Siftly. While not directly related to the gender of their superior, Siftly's report also finds that a significantly high number of female advertising professionals (11%) report having been a victim of sexual harassment or assault in the ad industry. This number spikes to 36% among those having been victims of sexism or/and sexual misconduct. As #MeToo illustrates, awareness is critical to ending a culture that permits abuse. "This [entire issue] needs fixing," says Striefler. "Let’s be the change we’d like to see in the world, and make agencies a zero-tolerance zone for sexual harassment. Human decency demands it. The talent war requires it."